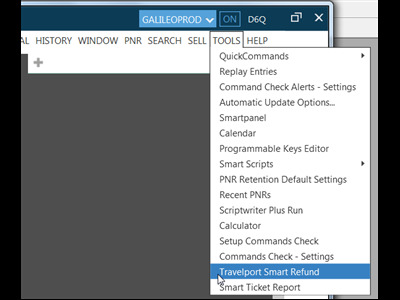 The Smart Refund Mask is a GUI format that Smartpoint user can use for e-ticket refund functionalities; either full refund, partial refund or cancel refund. 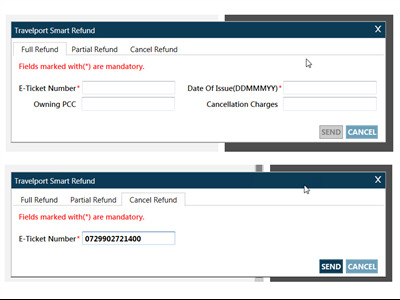 The Smart Refund Mask is addressing the customer pain point of using the cryptic format and the GDS fill in format. It replaces the current cryptic format the agent is doing with a friendly GUI format. The system functionalities remain the same, the plug-in DOES NOT offer new system/host functionalities that did not exist previously. 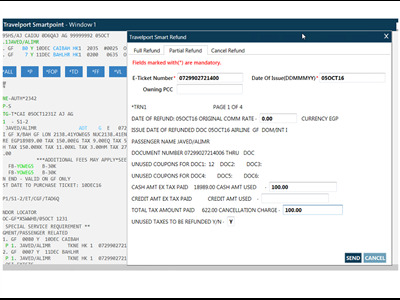 GUI format that Smartpoint user can use for e-ticket refund functionalities. Supports full refund, partial refund or cancel refund.